When I talk about my recent book The Future of Liberalism, and especially when I talk to more conservative audiences, I’m frequently asked which liberalism I favor: “classical liberalism” with its preference for the market and its belief in individual freedom, or “modern liberalism” and its reliance on the state and commitment to equality. One thing I know is this tendency to see two different kinds of liberalism is wrong. It’s true that Adam Smith argued in favor of the market, just as John Maynard Keynes made the case for state intervention. But liberalism, as I define it, means as many people as possible should have as much say as feasible over the direction their lives will take. Listen to Alan Wolfe discuss The Future of Liberalism on the Contexts Podcast. Autonomy and equality are goals that transcend the classical/modern divide. In the 18th century, legacies of feudalism and the rules of mercantilism created a situation in which free markets could both allow people greater control over their lives and at the same time spread that capacity to others. Smith, although claimed today by libertarians, was a liberal, indeed one of the great liberal thinkers, not because he made such a lasting contribution to economic theory but because he developed a moral philosophy respecting both freedom and equality. Under conditions of contemporary capitalism, by contrast, individual autonomy is threatened by poverty, economic instability, and concentrated corporate power. Using government to control economic fluctuations, as Keynes argued, gave society the capacity both to improve the ability of any one person to become more autonomous as well as to extend the same notion more broadly. Keynes, a member of the British Liberal Party, was never a socialist. He, like Smith, was a liberal because he too respected both freedom and equality. But autonomy as well as equality is always constituted in a social context. Liberalism is as much a philosophy of how society ought to be organized as it is a defense of individual autonomy. Indeed one of the tasks in which so many liberal thinkers engaged was to defend and protect the idea of society against its rivals. For Immanuel Kant, this meant defending society against a Rousseauian preference for “nature.” For Thomas Jefferson it meant protecting the capacity for self-government against those who argued that law was God’s province, not that of human beings. Liberalism emerged as a theory of human purpose. We have the power to shape our lives according to purposes we fashion together with others. The concept of society protects us from the anarchy of individualism on the one hand and the designs of all-powerful states on the other. Society is made possible because human beings have culture at their disposal. In writing my book I was struck by the overlap between the ideas for which liberalism stands and how theorists from Emile Durkheim to Clifford Geertz understand and emphasize culture. Culture offers the means by which human beings establish and realize their collective goals. Culture both expands individual freedom (because it multiplies so enormously the range of possibilities open to us) and promotes equality (because it ties the fates of individuals together through language and symbols). Cultureless creatures would live with neither. This is why it’s important to recognize that in today’s intellectual climate, the great threat to liberalism comes not from those who assert the priority of God over human creativity but from those who claim culture is merely a byproduct of evolution, something that happens in spite of what individuals want and reflects processes of transmission driven by something like our genes. (Richard Dawkins calls these means of transition “memes”). Evolutionary psychology, sociobiology, and their offshoots such as behavioral economics are anything but breakthrough sciences. They are, in fact, a throw-back to the ideas of such thinkers as Bernard de Mandeville and Thomas Malthus, who questioned liberalism’s understanding of human intentionality from the start and opted instead for one form of determinism or another. Liberals shouldn’t be afraid to call themselves liberal. Their tradition is a long, honorable, and consistent one. It includes many different thinkers with many different ideas and approaches. But so long as they’re committed to the notion that freedom can’t exist without equality and vice versa, they are liberals. I am proud to call myself one of them. Alan Wolfe is in the political science department at Boston College. He is author of The Future of Liberalism and is a contributing editor (and blogger) at The New Republic. surely, culture can be just as oppressive. it is through language and culture that we construct and reify social identities, including deviancies, such as sexual minorities, and identities that are relegated to the margins of society, such as race, because they are defined in opposition to the dominant identities in society. therefore, i cannot see how culture can be understood as something that is inherently liberatory. also, is it possible for social actors to foresee all of the consequences arising from their efforts to push humanity in a positive direction? by this, i am questioning whether the humanistic model that you seem to embrace accurately conceptulizes human intentionality. this line of interrorgation is not meant to reflect evolutionary psychology or sociobiology. rather, i wonder how you defend your position against anti-humanists who stress the unintended consequences of human agency. 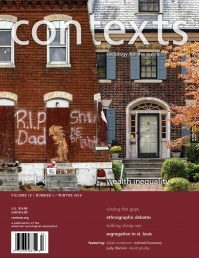 i just read a manuscript in which the author argued that the civil rights movement - through which african americans attempted to redefine citizenship, making it race-less social identity - had the effect of obfuscating regional identities within the african american population, along with the unique forms of subjugation under which such specified identities suffered. in fact, the discourse of martin luther king contributed to the bifurcation within the african american population; a distinction made between the "good blacks," and those who failed to conform with the behaviors associated with citizenship, or the "bad blacks." this dichotomy, according to the argument, contributed to the contemporary schism between middle-class african americans and the urban poor and underclass. therefore, even a social movement oriented toward "freedom," can entail contrary consequences by simply unwittingly creating new forms of oppression. "Liberals shouldn’t be afraid to call themselves liberal. Their tradition is a long, honorable, and consistent one." Neither consistent nor honorable. Classical liberalism of Locke, Say, Bastiat, etc was opposed to the subordination of the individual to the collective. Modern liberalism is that same collectivism which opposed Locke and Mill. The argument Mill put forth in "On Liberty" is that individuals are competent to handle freedom and the presumption should be on the side of individual freedom, negative freedom, not positive freedom which collectivizes all of the individual's resources like Rawls does. The liberal answer to this is well known. Robert Paul Wolff in his "The poverty of liberalism", Amy Gutmann in her "Liberal Equality," and Gaus in his "The modern liberal theory of man" all claim the same thing: Mill was only half right. The presumption of individual liberty should exist in areas where man is competent to make his own decision, but the liberal concludes that man isn't competent to make his own decisions in most areas. The result is an infantilization of man, the Hobhousean "man as child" theory of man, which Mill so heroically opposed. Mill rightly saw that if you treat men like irresponsible infants, they will act accordingly. The results can be seen in modern society, where Americans epitomize irresponsibility.